Received was a 1014.0 g, 14.5 x 13.7 x 8.5 cm focally disrupted cystic/solid mass from the mediastinum and chest wall of a 64 year old woman. The external capsular surface was pink, purple with minimal fibrous adhesions. Cut surfaces were pink-tan with a fish-flesh appearance and scant necrosis and hemorrhage, involving less than 5% of the specimen. There was a clinical history of a long-standing pleural-based mass with new recurrent pleural effusions and mass adhesion to the lung and anterior chest wall. The neoplasm was comprised of epithelioid to spindled cells with hyperchromatic and irregular nuclei, variably hypercellular and hypocellular areas, prominent hyalinized blood vessels, regions of necrosis, and a mitotic rate of 4-7 mitoses per 10 high power fields. 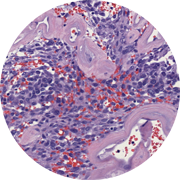 Immunostains show that the neoplasm was diffusely positive for bcl2 and STAT6, focally positive for CD34, and negative for AE1/AE3, CK903, S100, CD99, and desmin. 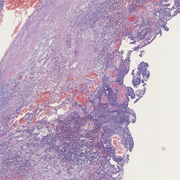 The morphologic and immunophenotypic features support the diagnosis of malignant solitary fibrous tumor.